Church in China | Adventuring Towards . . .
Today I adventured to a new church for Mass. I went to St. Joseph’s Cathedral in Wangfujing, also known as 东堂 or East Church. I think that means that I win Beijing Catholic bingo – I’ve now been to the South, West, North, and East churches. I went to the 4pm Mass because I was meeting friends afterwards. Only as I walked up to the church did I remember that it was an English Mass. I’ve generally avoided them (or, rather, not gone to any extra effort whatsoever) because after a few weeks I found that I caught as much or more of the Mass in Chinese than in English when spoken by a Chinese priest. We had an Indian priest, though, which oddly makes me feel like I’m back in America? Foreign priests are commonplace in the US; Tulsa was even a missionary diocese, to make our dependence on international priests explicit. We did several of the Mass parts in Latin chant. I’ve always treasured the time I spent with one of our priests at the Newman Center in Tulsa learning Gregorian Chant, including the entire Missa de Angelis, and it has served me well. (Speaking of, that was an option at karaoke yesterday. Along with the Regina Caeli. Odd?) And in my capacity as choir director at the Newman Center, I advocated for at least a basic familiarity with chant and the Mass parts in Latin, because Latin is the language of our universal Church. This conviction has been reaffirmed in my international travels – Latin is our common denominator. Plus, if the Chinese can learn it (they don’t even get any cognates! ), there’s just no excuse for English speakers. After Mass, I met up with some family friends from the States. It was incredible to see them – they’re wonderful people, and I felt so happy hearing those Oklahoman accents. It was also a very vivid reminder of how much time has passed since I was last in China. They came over to China in March of 2010 to adopt a son, and I flew over to Guangzhou from Xiamen to hang out with them while they dealt with the paperwork. I got to help a tiny bit with communication, and got them a few memorable meals (some for good reasons, others because there were cornflakes on the salad). Five years later, that son has grown into a hulking football player, a high school graduate, and a sharp young man. Similarly, another of their sons was just learning Chinese when they came over for the adoption. He was full of questions – “how do you say ___” – as a beginner asking someone more advanced. Since then, he’s spent a year at Peking University studying Mandarin, picked up a few more languages at school, and is off to Japan in the fall for a year of study there. Now when we talk, it’s much more as equals, and more about experiences than vocabulary. “Do you feel like you’re a different person in China?”, that sort of thing. He’s also way more of an old Beijing hand than I am, having spent a year here. I told him a bit about the difficulties of my third week here – I never realize how deep those emotional pits are until I’m out of them, but being sick, fretting about the lack of progress at work, dealing with a straight week of worst pollution I’d experienced, and various other collisions of expectations with reality really did a number on me. He said that he loved Beijing, but “it can really chew you up and spit you back out”. Sounds about right. 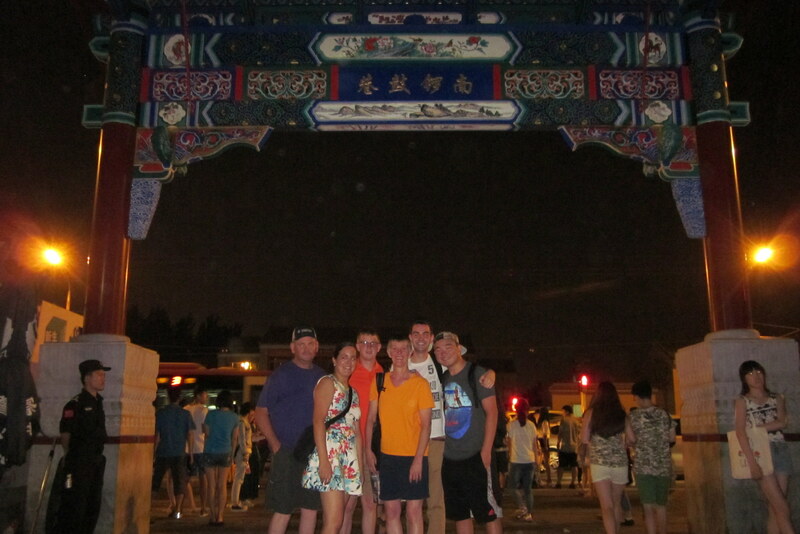 We went to 南锣鼓巷街, a touristy market street on the west side of Beijing. We walked up and down, grabbing dinner and several beers at a restaurant and capping the night with 绵绵冰, my favorite Taiwanese dessert (super finely shaved ice topped with fruit). It was cold and delicious, basically everything I was expecting. It is just so ridiculous that our paths have not only crossed once again, but that it happened in China! Fate is, indeed, like a strange. I woke up in the midle of the night to a woman screaming. Look outside my window to see a man beating up a woman. I go to the front desk and ask them to call the police. They call the police and the police “don’t want to get involved”. Amazing. I went to 北堂 again today. I had the route figured out and, feeling healthy, had a bit more pep in my step, so I made good time. I got to the church at least 10 minutes before Mass started, and was able to stake out a good spot near the front. This is important because I don’t think the music is in hymnals, just on two screens near the front, which I couldn’t read last time. The only thing I caught from the homily today was that “we all have our own crosses to bear”. I did find myself wondering what people in the pews were hearing back home, and praying for my country. A lot of “I’m so sorry, Father”s. I’ve written a lot about the Church in China in the past, and most of it holds true here in Beijing. The main new thing I’ve noticed is the fairly regular occurence of priests or members of the congregation taking Hosts back from people who try to walk away with It. I think I saw this once in Xiamen, and it was very confusing to me at the time; I only later realized what must have happened. Maybe we get more tourists at the Beijing cathedrals, who don’t know what’s going on but want to get the snack that everyone else is getting? I’m not sure, but I’ve seen this happen at least once at each of the Sunday Masses I’ve been to so far. I am really impressed and gratified by the sharpness of their observation, and their courage in confronting people (gently); as an Extraordinary Minister of Holy Communion at my home parish, I know it’s a difficult task for many reasons. They’re both images of Mary with the child Jesus, but with Asian features and dress. These aren’t great pictures, but I also bought several prints of each at the religious goods store. Plus a book on The Art of the Catholic Church in China! I took my time walking back to the subway as well, and stopped for noodles on the way. In the evening, I got a few friends to go to the U-Center for fish. This was a great choice. We got one big fish with potatoes and broccoli, plus rice and tea, for the four of us for 100元. And afterwards I splurged on a kumquat-lemon drink from Coco which was all that I had hoped for, and more. You can see a forecast of the pollution at http://aqicn.org/city/beijing/. The next two days are supposed to be more of the same. I haven’t seen a hint of blue in the sky since last Sunday. My advisor didn’t want to meet until 4, but the other Tsinghua Maria was supposed to be at work at 2:30. We set off together around noon, rehearsing the walk to her lab. We went through the main gate of Tsinghua University and then took an unexpectedly scenic tour of part of campus, looking for her building. We parted ways there, and I set off on my lonely trek to 蒙民伟科技楼 where I’ll be working. It’s kind of on the outskirts of campus. By the time I got there, I was exhausted. I’d walked about five miles in 90+ weather, most of it wearing a face mask (which makes drinking prohibitively difficult), and my shoes were apparently not broken in properly so I had blisters :( I need to get bike . . .
At 4, I met Prof. Feng and Prof. Li in Feng’s office. It was a short meeting, mostly figuring out all the things they have to help me apply for (building card, cafeteria card, student card, internet access). Then they took me on a tour of the department. We saw two student offices, where he introduced me, and several labs. It was all quite impressive, with things ranging from a decent-sized tensile machine to an AFM setup, plus cell culture capabilities. My favorite part was the machine doing tensile testing on spider silk. I didn’t realize they even did their own experiments, honestly; we usually collaborate with experimentalists and do the simulations ourselves. When we were done, they had a student take me to the nearest gate. As we walked out of the building, I asked her her name, in Chinese. 你叫什么名字？ This is first-day-of-Chinese-1 stuff, people, the sentence you learn after “Hello, my name is __”. But she jumped and looked like she’d seen a ghost. This sort of story is where the term “talking muffin” comes from. There’s a joke: Two muffins are in the oven. One muffin says to the other, “Man, it’s hot in here!” and the oher muffin goes, “Whoa! It’s a talking muffin!”. That’s how I feel sometimes. I’m just making conversation, and they’re freaking out because they didn’t think I could talk. Anyway, it turns out not everyone in Beijing is so over Chinese-speaking foreigners. We rode on her moped, which was slightly terrifying as I am about a foot taller and waaay heavier than her. I was quite impressed by her ability to handle that, as evidenced by us not dying. Once at the gate, I took a taxi. Yeah, this can’t be an everyday thing but today was exhausting. It was totally worth the 17元; no regrets. I showered and a bit later went to dinner with a few other EAPSI students (at the fake 100 place). We had the things we’d had before, plus a few new dishes. One of them was . . . twigs? I don’t know else to describe them. Dinner conversation was interesting, because someone pointed out that the three people in our group with Chinese experience (including me) are religious. One guy is Mormon and the other apparently trained to be a Lutheran minister. So we had a discussion about religion in China; I was interested to hear about their experiences because I go to the patriotic church, but there isn’t a state-sanctioned Mormon church. The five recognized religions in China are Daoism, Buddhism, Christianity, Catholicism, and Islam; with that recognition comes simultaneously more restrictions (a lot of watching, I think, with repercussions, plus the whole appointing-bishops thing) and more freedom (Chinese and foreigners can worship together). The Mormon said he has to present a passport to go to his church, and they have to clear out before the Chinese nationals go in. Back at the hotel, I spent a while helping some of the other EAPSI students with tasks that required some Chinese language skills. The biggest challenge was calling a taxi for 4:30am. This required a phone call in Chinese, which is always intimidating to me. (First I pressed the button for English service, figuring I’d take the easy way out, but when I actually spoke English with the woman who answered, she just hung up on me.) A half hour later, when I was supposed to get a confirmation phone call, I instead got a text saying that no one wanted to accept the ride, sorry. So I guess he’s walking . . . Final note for today: I took another EAPSI girl to get our hair washed a few days ago, and the guy tried to hard sell me into doing this treatment for dry hair. When I refused, he got all passive-agressive about it with me. He asked if my hair was easy to comb after the shower, and I said yes. “No, it’s not,” he responded. Later, she and I were talking and we realized they hadn’t used conditioner. No wonder it was hard to comb – there’s a product out there that is literally designed to fix this problem, and they didn’t use it. But for a few days afterwards, I found myself struggling with my hair and wondering if it had, indeed, always been hard to comb? So yesterday I bought Pantene conditioner, not the Chinese brand that the woman at the supermarket pressured me into buying, and today my hair feels great again. I don’t know if Chinese hair is different or if Chinese conditioner is just terrible? It’s still not as bad as that lotion I bought here once that made my skin feel like it was burning, but what good is conditioner that doesn’t condition? I ddin’t realize this because I usually went to Saturday evening Mass in Xiamen, but apparently Chinese Catholics are early risers. I say this because at many Beijing churches, 8am (the earliest Mass at Nativity in Menlo Park) is the “last chance Mass”. and was nearly full when I arrived at 8:20. Actually, I had a hard time finding a seat until one of the women that had been on the bus with me indicated that I should take her spot, and she went to the back. It was one of those small but incredibly meaningful moments that epitomize the Church in China for me. It felt comfortable to go to Mass in Chinese again. We sang the sprinkling rite using the exact same song as we used to sing in Xiamen, and I still remembered a lot of the words. (Next time, though, I need to get there earlier and sit up closer to the TV screens with the words and music.) Lectors speak very clearly and slowly in whatever language they’re reading in, so it’s always very easy for me to understand the readings. The homily is always the most difficult part, and this priest was especially long-winded. The homily was perhaps 20+ minutes, and he spoke for another 20 at the end of Mass. I catch about 20% of that extemporaneous speaking, max. I had planned to get off the bus at some interesting location to get lunch, but wasn’t able to react quickly enough. Instead, I got lunch at a Western (as in, western China) restaurant. That turned out well, even the part where I didn’t realize I had to give my order to the kitchen myself. I sat down to wait for my food and ended up catching the end of overtime and penalty kicks for Brazil vs. Portugal in the quarterfinals of the under-20 World Cup. Portugal totally whiffed a few shots and lost. I went back to my room, where I took a delicious nap and did some internet struggling. In the evening, a few of us went out to forage for food in the area I “discovered” yesterday. We ended up getting [more] Xinjiang noodles, but no complaints here. I treated myself to a Magnum bar (maybe a weekly thing?) and then went back to the room where I finally got caught up on these journals!